The Outer Space Pathfinder Wall Panel encourages children to develop eye-hand coordination while visiting distant galaxies! 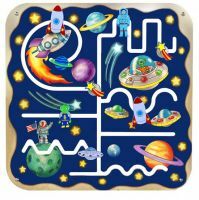 With a variety of paths available, kids will enjoy tracing the colorful paths through outer space. So encourage your child to fine-tune their logical thinking and visual tracking skills while participating in imaginative play with the Outer Space Pathfinder Wall Panel. Ages 3+. Includes space shuttles, shooting stars, planets, aliens, and more!